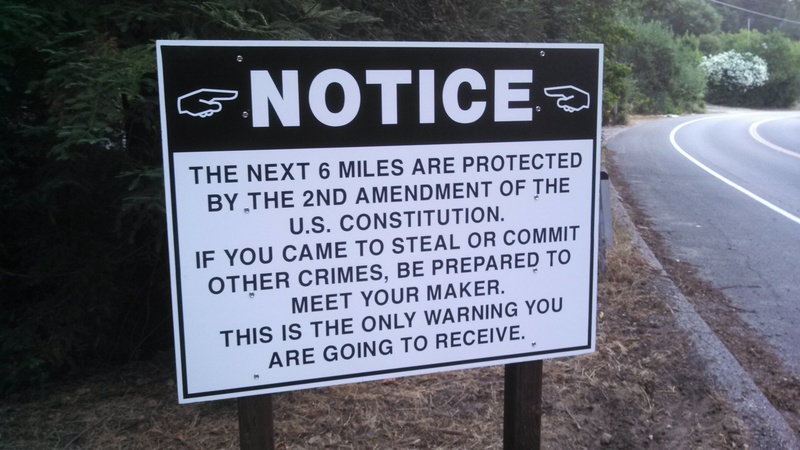 Bear Creek Road – Don’t Mess Around! If anyone is considering any ill behavior on Bear Creek Road… think twice. Thanks for sending this photo in! I knew I shouldn’t have pulled over to pee the other day. I’m really sorry. I won’t do it again. It was skerry enuf anyway! Who is this person speaking for?? Uh oh. Is “spirited” driving considered a crime? Ah, yes, attempted behaviour control by fear. I will be sure to stay safely in my own square as to ensure there are no mistake- innocent or malevolent- of, god forbid, me being on “your” property”. I’ll be sure to retaliate with my gun. Great, another paranoid American who believes death is the appropriate punishment for any crime. The Bear Creek Taliban rises! And democracy, peace, love, and understanding fall. the sign was taken down last week apparently. I called the Sheriffs Office within this last year to report a disturbance of some neighbors getting into a fight. Took the the deputies 30mins to arrive. I talked with the deputies and told them that the response time had me concerned and worried for my family’s safety. The deputy suggested that I get a firearm for personal protection. I wonder if this is a sign of the times and if we will see more of this in the future around the valley. The sign is back up and on a nice looking fence for about 2 months now. First off I’m a 2nd Amendment guy. The author should have stopped after the first sentence. The rest is unconstitutional. 1st amendment says you can express your opinions…Check. 2nd amendment says you can bear arms…Check. However, the constitution says that anyone suspected of ANY crime has the protection of having a jury trial followed by punishment handed out from a judge if deemed necessary. So if a teenager is stealing your hubcaps YOU WILL SHOOT THEM DEAD?!!!?!? Please show me where in the constitution, federal laws, or local laws that stealing hubcaps is punishable by death. Please show me where in the constitution, federal laws, or local laws that you and you alone can legally be a jury, judge, and executioner. The author should be ashamed of themselves.